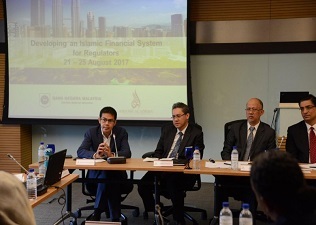 SESRIC in collaboration with the Bank Negara Malaysia (BNM), Central Bank of Malaysia, organized the Training Workshop on ‘Developing an Islamic Financial System for Regulators’ within the framework of the OIC Central Bank Banks Capacity Building (CB-CaB) on 21-25 August 2017 in Kuala Lampur, Malaysia. The main objectives of the training were to identify the necessary content and coverage of Islamic finance system; Assess the proper measures and steps to regulating Islamic financial system; Examine a few models of Islamic finance management and offering in the modern history; and Formulate the template for the Islamic financial system from regulator’s perspective. Participants from middle to senior level officials from central banks, government ministries and regulatory agencies involved in developing strategy for Islamic finance in different OIC member countries attended the programme.